In late 1940 the Royal College of Art was evacuated to Ambleside in the Lake District; Mahoney and Percy Horton were among the male staff. 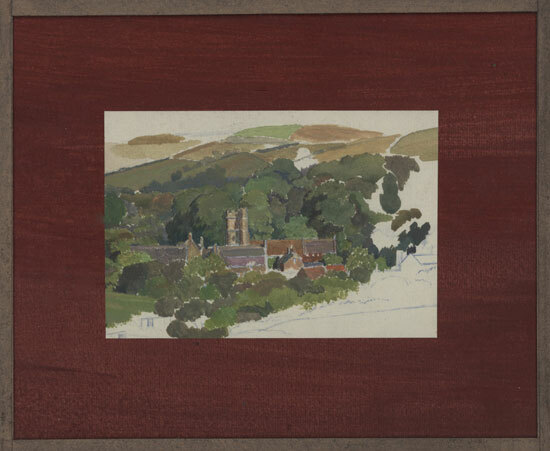 During this time Horton also worked for War Artists Advisory Committee recording scenes in Lake District, especially of the local landscape and population. Horton's studies of landscapes are not acardian; his hills are seen above the roofscapes of Ambleside’s less glamorous buildings. Indeed, most of the landscapes exhibited are taken from the site of the house in which he lived with the Walmleys (the well-known photographers). He repeatedly researched a subject by drawing it from several angles at the same time, exhaustively, adjusting the design. Horton is the convenient chronicler of many of the happenings at the College, and inadvertent one perhaps, but fortunately his letters have survived and wonderfully illustrate the frustration and stimulation of life in Ambleside.